Margaret Mary Pugin was born on October 17, 1849, of the union of Pugin and his third wife, Jane Knill, in Ramsgate. At the time of her birth, the ages of her six half-siblings ranged from six to seventeen. 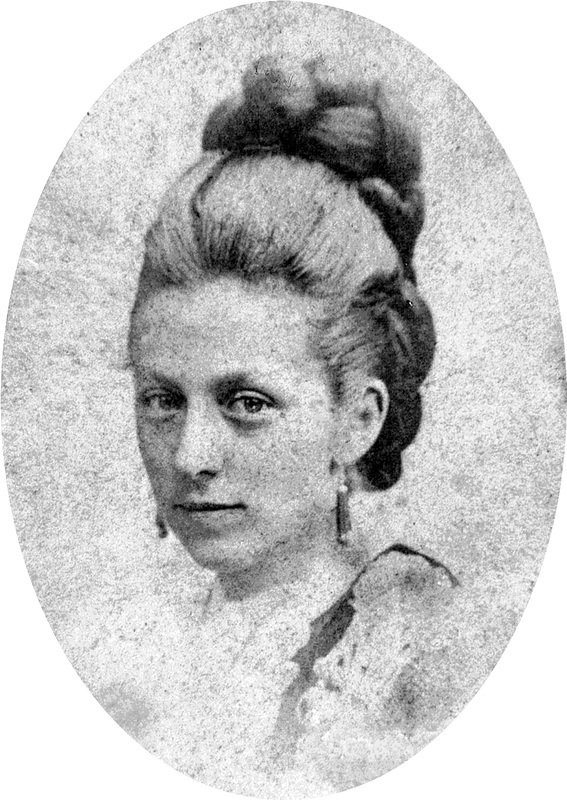 She later had one full sibling, Edmund, known as Peter Paul, who was born in June, 1851. 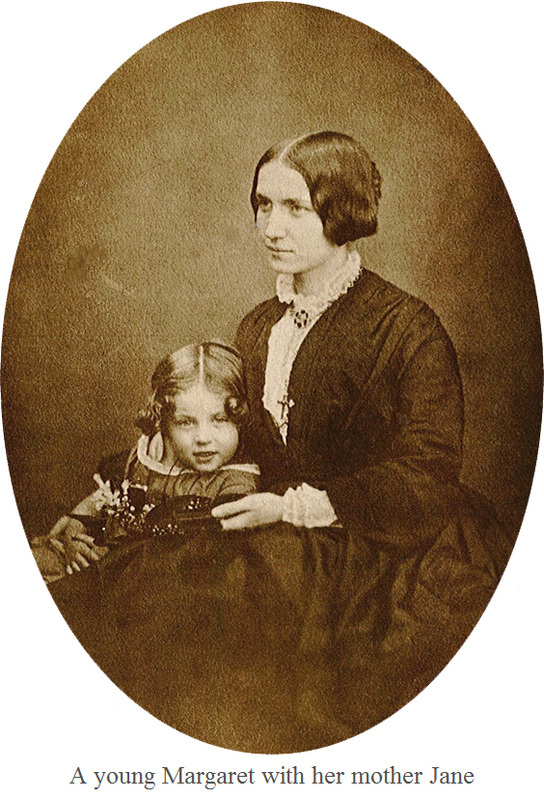 When Pugin died in September, 1852, Margaret was nearly three years old. After Pugin’s death, the family let The Grange, Ramsgate in 1853, and moved to Birmingham, where the eldest child, Edward, and their friends and business associates, the Hardmans, worked. Eight years later, in 1861, when Margaret was about 12, the family returned to The Grange. Pugin’s biographer Rosemary Hill believes Jane would have taught her to read and write by the age of 7. The child was called “Mattie” by her mother and her two husbands. On September 14, 1870, Margaret married Henry Francis Purcell, at St. Augustine’s Church, now known also as St. Augustine’s Shrine, Ramsgate. Purcell was from Carrick-on-Suir, was a law graduate of Trinity University, Dublin, and had been called to the bar at Temple, London. They made their home from 1871at 9 Holden Terrace, St. George’s, Hanover Square, Belgravia, London. Margaret and Purcell had four children. The first was Mary, who was born in 1872, in Bombay. She married Ralph Joseph Riddell at St. Augustine’s Church on September 15, 1898. The Tablet recorded that ‘The reception was held by Mrs. Welby Pugin, grandmother of the bride, at the Grange’. They had two children. The second was Charles Henry Cuthbert, born 1874, d. 1958. Charles was an architect and joined the firm of Pugin & Pugin (1851-c.1928). He was still active into the 1950s. He married Hilda Gibbs Wilson of Glasgow in 1925. They had one child, Michael Pugin Purcell (1926-1993), the father of one of the authors (Jeremy Pugin Purcell) of this article. The third child was Eileen, known as Margaret Eily or Eily, born 1875. She married Commander C.E. Gladstone, R.N., on September 15, 1903, at St. James Church, Spanish Place. It was reported that, once again, ‘A reception was held by Mrs. Welby Pugin, grandmother of the bride, at 67, Gloucester-place, Portman-square’. After Eileen came Nora (or Norah) Jane, who was born in 1877, at Westminster. On January 23, 1900, she married Eustace Henry Lonergan at St. Augustine’s Church. ‘A reception was held at the Grange by Mrs. Welby Pugin (grandmother of the bride)’. Lonergan died of the Spanish flu in early 1919 and Nora subsequently married Reginald Mugliston on June 20, 1920. In the 1860s and 1870s Henry Purcell traveled the globe. He was involved in the famous Tichborne Claimant case. In the Lloyd’s Weekly London, July 6, 1873, p. 7, he recounts that he was retained by a defendant in June/July, 1866, and sailed for Chilé (spelled “Chili”) on September 17, 1868, to examine witnesses before a commission. In August, 1871, he traveled to Australia. Purcell was on two occasions a judge on the Norfolk legal circuit to Bombay. When he died on June 4, 1877, he had gone to India to try a case regarding an Englishwoman. He died there from a disease he caught whilst in the course of his duties. Margaret and the baby traveled to Bombay to claim his body. The widow Margaret spent some time with George Thunder, a British Army officer, on her trip back to England on board ship. George Thunder had been raised in Ratoath, north of Dublin, and had 13 siblings. Margaret and Thunder were married in 1878. Their first address was 9 Holden Terrace, St. George’s, Hanover Square – where Margaret and her first husband had lived. From 1881, however, their address was 18 Royal Road Ramsgate. Margaret and George Thunder had two children: James Augustus (1879-1954), born in Bombay, and Michael Hubert (1881-1916), born at The Grange, Ramsgate. For more on Michael, read Jim Thunder's retrospective HERE. Margaret died in 1884, during (or from) childbirth of her seventh child when the Thunder boys were about five and three. James Augustus was present for the funeral and remembered the lowering of the coffin. She died at Ramsgate and is buried in the family vault at St. Augustine’s church. 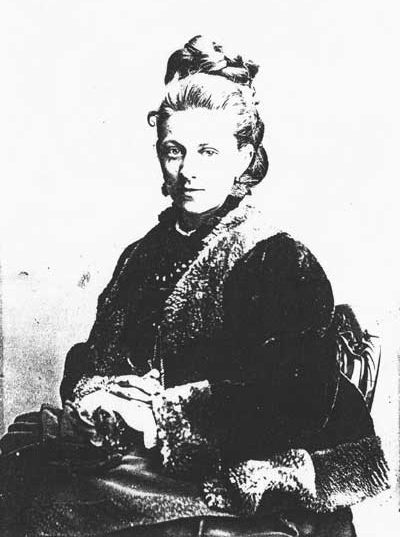 George remarried, to a woman Louise Meisterzheim (also spelled Mestusen), and had another child, Marie. George died in 1904. 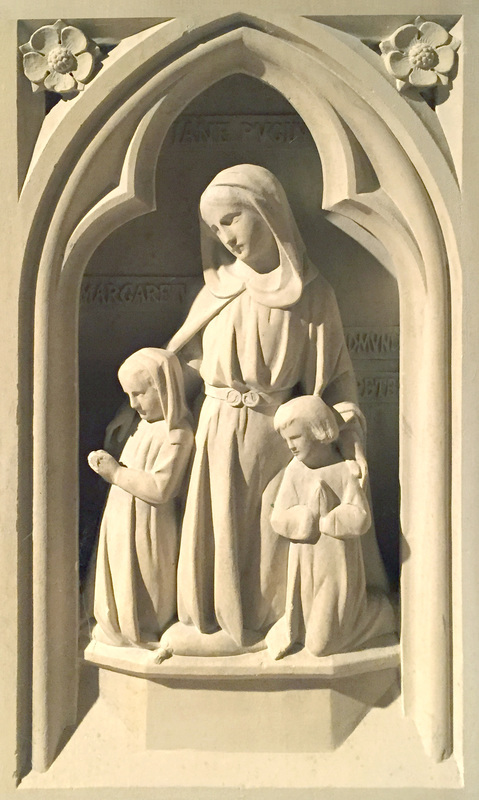 Jane Knill Pugin, the children’s maternal grandmother, raised Margaret’s six children after Margaret’s death at The Grange, Ramsgate. During the youth of the Thunder boys, their father was posted to India. Both boys and their first cousins were in residence at Clongowes Woods, outside Dublin, at the same time as James Joyce, who wrote of a character named Cecil Thunder in his Portrait of the Artist as a Young Man (1916). James Thunder also attended University College Dublin with Joyce. James met his future wife, Gertrude Buckley, a native of San Francisco, at the Roehampton Sacred Heart Convent school, where his paternal aunt, Rose, was mother superior and where Pugin had designed two stained glass windows. James later emigrated to the United States and married Ms Buckley in San Francisco in 1905. They had five children, one of whom, Eileen Thunder Allen, still survives at the time of writing this article (August 2014). One son, Ivan (1913-2010), was the father of one of the authors. Michael never married and had no issue. He was educated at St. Augustine’s College, Ramsgate. He was wounded in the Boer War, was a manager of a tin mine in Malaysia (where, as a gentleman jockey, he won a Selangor Turf Club silver cup on the site of what is now the Petronas Towers) and died as an RFC pilot in World War I after crashing after take-off. Michael is buried in the graveyard, as are other various other descendants, at St Augustine’s in Ramsgate. NOTE Our aim for this section of the Pugin Society website is to keep information about members of the family clear and straightforward. We are not including footnotes, therefore. However, full annotations exist, and if you have any queries regarding the information here please contact Catriona Blaker.